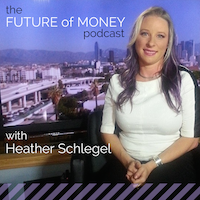 Host Heather Schlegel talks with Ben Waber, President and CEO of Humanyze. 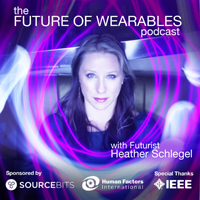 In today's interview, recorded on May 18th, 2015, we discuss wearable technology and behavioral analytics to improve work environments. Ben Waber is a senior researcher at Harvard Business School and a visiting scientist at the MIT Media Lab. He is also the president and CEO of Humanyze, a management consulting firm that uses social-sensing technology to understand and improve organizations. He received his Ph.D. from MIT for his work with Alex “Sandy” Pentland in the Human Dynamics group at the Media Lab. Waber’s work has been featured in major media outlets such as Wired, The Economist, and NPR. He has consulted for industry leaders such as LG, McKinsey & Company, and Gartner on technology trends, social networks, and organizational design. Follow Ben on Twitter @bwaber. Pioneer power couple Brenda Laurel and Rob Tow recount their work in Virtual Environments, Emotions and Robotics at Interval Research in the 90s. Today's interview, was recorded at their home, Locus Voci, in the Santa Cruz mountains on March 27, 2015. Their ideas and prototypes are relevant now more than ever. I hope you enjoy listening. The Placeholder Project, video (Interval Research). More about Brenda, Brenda on Twitter @blaurel. More about Rob, Rob on Twitter @robtow. Visit Interval Research's original website via the Wayback Machine. Brenda Laurel has pioneered interactive media as a game designer, researcher, writer and teacher. In 2006, she was a Distinguished Engineer at Sun Microsystems Labs. For more than 20 years, Brenda has worked as a programmer, game designer, software producer and researcher for companies including Atari and Atari Labs, Activision and Apple. Based on her research in gender and technology at Interval Research, she co-founded Purple Moon in to create interactive media for girls. She pioneered Virtual Reality as co-founder and President of Telepresence Research (1989-91) and as co-designer and producer of the VR project “Placeholder” at the Banff Centre for the Arts. Brenda served as a professor and founding chair of the Graduate Program in Design at California College of Arts, the Graduate Media Design Program at Art Center College of Design in Pasadena and professor in Computer Science at U.C. Santa Cruz focusing on games, interaction design and design research. Her books include The Art of Human-Computer Interface Design (1990), Computers as Theatre (1991), Utopian Entrepreneur (2001), Design Research: Methods and Perspectives (2004), and Computers as Theatre: Second Edition (2013). She is currently launching Neogaian, a new consulting service specializing in interactive media that incorporates progressive values. Rob Tow is an ex-Xerox-PARC computer scientist and part-time abalone diver. He has worked at small start-ups (Skully Helmets, Compression Labs, ParcPlace Systems) and major research labs (Northrop Aviation Advanced Systems, Schlumberger Palo Alto Research, Xerox PARC, Interval Research, AT&T Labs, NASA Ames Research Center) over the course of a career that spans 38 years. He has thirteen U.S. patents that cover amorphous silicon, image processing, robotics, wireless sensor networks, and UI. He likes to invent and build things, and is currently part of a team prototyping an embedded Android device that sees for the visually impaired. He lives with his wife Brenda Laurel at their home Locus Voci in the forested Santa Cruz mountains, high above Silicon Valley. Rachel Kalmar is a Data Scientist, previously at Misfit, is known for wearing the largest collection data tracking devices. In today's interview, recorded on May 7th, 2015, we discuss data standards, data ownership and passively collected biodata. You can follow Rachel on Twitter @grapealope. Rachel is a data scientist, previously at at Misfit Wearables, where she wrangled noisy data and quantifed anything and everything she can. A Stanford neuroscience PhD, she's spent over a decade using data to explain, predict and influence behavior. She is active in the Bay Area hardware community and runs Sensored, a 1000+ person meetup group for people working on sensor devices and applications (meetup.com/Sensored). Rachel is an alum of the d.school, Singularity University, and Rock Health, and her favorite hashtag is #geekparadise. Today's interview recorded on May 4, 2015 is with Eliza Strickland, Associate Editor of IEEE Spectrum. In it, we discuss Health, Wellness and the hardware collecting our data. Be sure to explore IEEE Spectrum special issues on The Human OS, mentioned in the podcast. Strickland has reported on science and technology for 15 years, writing for such publications as Nautilus, Discover, Wired, Foreign Policy, The New York Times, Salon, Mother Jones, and The New Republic. She also contributes radio stories to NPR’s midday talk show, Here & Now. She tweets from @newsbeagle.